If your purchase with Electacourse includes an exam booking you will have received details about where and when to take your City & Guilds exam. On successful passing of your exam your result is passed automatically to City & Guilds for them to process the certificate. Generally City & Guilds can be relied on to supply the certificate in up to 15 working days. Our exam partner will then send the certificate by Signed-For 1st Class Royal Mail to you. However it has been known for City & Guilds to be slower this in turning round the certificates and unfortunately sometimes it can take quite a bit longer than 15 days. Neither Electacourse nor our exam partners are able to make City & Guilds rush individual certificates. Please consider the time delay involved with certificate turn around when you make your exam registration. Do not rely on the certificate arriving quickly – ie for a job or other requirement. If you prefer to make your own exam booking arrangements, then you may find your local FE College can take you as an exam-only candidate. Do you provide tutor support? We do not provide direct tutor support as it would increase the cost of the courses dramatically – compare our prices! All our courses are designed for study at home, with no time constraints or pressure. However if you have a particular difficulty we will do our best to help, please contact us using the form. Our courses are geared towards accredited qualifications such as NVQ or City & Guilds. Examinations are sat at an approved examination centre and upon passing you will receive a fully accredited qualification. We do not provide accreditation ourselves. Will I receive a recognised qualification? Yes, on successfully passing your City & Guilds exam. When you feel ready to do so, you can use the Electacourse Exam Booking Service to take your exam at an approved centre. As long as you pass at an approved examination centre, then you will receive a recognised qualification for that exam and a certificate from the relevant examination body. I haven’t studied for many years, do your courses allow for people like me? Returning to formal study at a college may present a problem. However, our courses are designed for home study at your own pace, making them ideal for people who haven’t studied for a while. I have no previous experience. Will this be a problem? Just as long as you have an interest, enthusiasm and a desire to learn, that’s all you’ll need. Our material can provide you with the information you need for certain courses, even if you are a beginner. Many courses have no pre-qualification requirements but please bear in mind that you may require practical training for certain qualifications, particularly certain electrical qualifications such as Inspection and Testing. Are you associated with City & Guilds or the IET? As a company, no, however many of our staff and tutors are members of IET and/or are City & Guilds qualified. All products and services offered on this website are the products and services of Electacourse and are not intended to give the appearance of being officially authorised, approved, endorsed by, or associated with City & Guilds or any other body. I am interested in becoming an electrician – what qualifications do I need? Login, Logout, Lost Password. Please help. To login to your account go to the login screen at My Account. You can initiate a password change from the link located on the login screen at My Account. Electacourse reply to every enquiry we receive whether through our contact forms, email, text message or phone. If you have not received a reply from us within three days (although in 99% of cases, we reply within a day of any enquiry), then please check you have given us a correct email address. On some occasions we find we get bounce back from emails that are not correct. If you haven’t had a reply, please contact us again and provide us with an alternative email address and/or a telephone number we can help you on. Yes, we use Stripe to process all payments. Stripe have over 100 Million accounts and use the highest levels of encryption. As a Stripe Merchant, we never get to see your card details they are only sent, securely encrypted, to Stripe. You will notice that the address of this site includes ‘https’, this means that all communication between you computer or device and the Electacourse website is encrypted – even if you complete a review or contact us. Why is there ‘Tax’ on my purchase? There is no tax on your purchase. Electacourse have agreed with the UK tax authorities that our business is not required to pay sales tax (VAT). Accordingly we do not charge any tax to our customers. Clayton Partners – Who are they? Clayton Partners Ltd is the company which owns Electacourse. All payments for Electacourse products will be made to Clayton Partners Ltd. You will see their details come up when you receive emails from Stripe or Paypal. You can communicate with Clayton Partners by using the Contact Form on the Electacourse website. Stripe – Who are they? Stripe is the company Electacourse use to manage payments for products ordered from this website. Stripe is an industry leading payment provider. All transactions are encrypted to the highest level AES-256 standard. At checkout you can choose to use your debit or credit card to make a payment. There is no charge to you when making your debit or credit card paymanet. You will notice that your credit card statement will show you having made a payment to Clayton Partners Ltd. This is OK. Electacourse is owned and managed by Clayton Partners Ltd. If you prefer to pay by phone, please call Electacourse on 07709031920 or use the Contact Form to tell us your telephone number and we will call you back. Yes you can. If you are uncomfortable with purchasing online, you can order on the phone by calling Electacourse on 07709031920 or use the Contact Form to tell us your telephone number and we will call you back. Electacourse do not store debit or credit card information. All phone orders are processed by Electacourse through the secure service offered by Paypal. What happened to your download protection scheme? It is with regret that from December 2016 we are discontining the download protection scheme. We have informed all our customers of the termination of the scheme. We have been forced to take this action as a small minority of unscrupulous customers have been using the scheme to support the illegal copying and distribution of our material for their in-class training. Others are using the scheme for reselling Electacourse products on eBay. These actions are in contravention of the Electacourse Terms and Condition of sale and significantly undermine our business. We apologise to our many valued and trusted protection scheme members that the actions of a few have compromised the benefits for the many – but is life ever thus? Our future business models will make it more difficult for such activities to be carried out and will enable Electacourse to invest more in providing the highest quality material for our valued customers. All Electacourse products can be viewed in up to date computers. If you have signed up for access to one of our online subscription services you will find the link to your active Membership of your online service(s) on the Dashboard page of ‘My Account‘. You will need to login with your username and password. Your download link is in three places if you created an account and in two places if you did not create an account at checkout. If you created an account, your download link is on the My Accounts page. Click on the Downloads menu and your list of available downloads will appear. If you have purchased a download product from Electacourse and you have a Microsoft or Yahoo email account, it is possible your purchase email containing the download link has gone to your Junk folder. The reason this happens is that the download link is to an application which Microsoft and Yahoo consider to be a security risk. They are right. Any application downloaded from the internet needs to be opened with caution; as a famous TV star/President would say, there are bad ombres out there. You can be assured that no Electacourse product contains a virus, malware or trojan and that it is safe for you to open. Mark the email as ‘Not junk’ and move it from your Junk folder to your Inbox (or any other folder). Then click on the download link. Make sure you have read the Download FAQ. How to download my files? You must download your purchase within 30 days of order. After 30 days or after three downloads, the download link expires. It is with regret we have had to put these restrictions into place, some customers were taking advantage of unlimited downloading. All Electacourse exam simulators are programs coded for Windows or MAC computers only, they will not run on iPads, Android tablets or ChromeBooks. DO NOT ‘run’ or ‘open’ from the download link, you need to ‘SAVE’ the files. 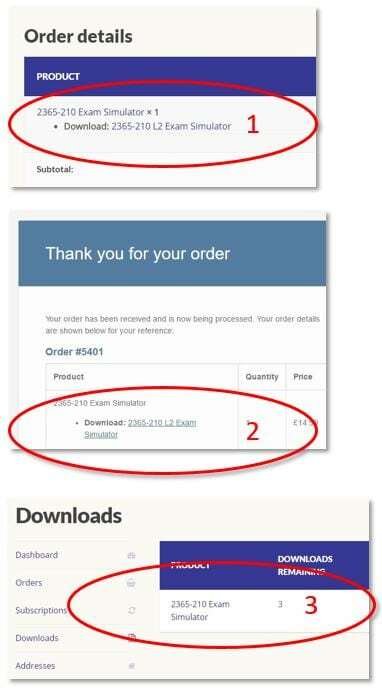 Your PC or Apple computer may warn you not to download the exam simulators. As they are programs your computer suspects them of carrying a virus. If asked, select the option which allows you to download the file. If you have already downloaded choose the option to run the progam. Your Apple MAC computer may have a security setting which prevents you from downloading applications. You will need to go to your systems security settings to allow downloads. Click on the download link. All browsers support PDF. The file will load directly into your browser. VERY IMPORTANT – Once the file has loaded into your browser, use the browser controls (or Right-Click your mouse) and save the file to your preferred location on your computer. Next time you want to view your PDF document, click on the file from the location where you saved it on your computer. Only click on the download link again if you are sure your file has not been downloaded. The download link will only allow you to click on it 3 times before it expires. Here is a YouTube video for PDF Downloads to iPad or iPhone. How to download the exam simulator to my MAC computer? Apple does not make it easy for you to install third-party developer apps onto your iMac or MacBook computer. You may need to adjust your system security preferences to download the exam simulator. First, make sure you are familiar with downloading onto a Mac using Safari – check the FAQ ‘How to download my files?‘. I can’t find my download on my computer, what can I do? Popular browsers such as Chrome, Firefox, IE Explorer, Edge and Safari have a ‘Gear’ or ‘Options’ buttons – generally in the top right corner. Click to find location of your download. Only Electacourse products which are formatted as PDF documents, can be read on iPads and Android tablets. From your email programme on your iPad/tablet, click the download link and the PDF will open in your tablet. You can then save that file to your iBooks app (iPad) or Google Play Books app (Android). There are many different ways of transferring to your iPad/tablet. A simple way would be to email the file to yourself as an attachment and open that email on your tablet, then save the file as about. Important Note: The Electacourse Exam Simulator apps are designed only for PC and MAC computers. They will not run on iPads or Android tablets. We are in the process of rebuilding these apps as online tests, keep coming back to this site to see if your app has yet become available online. Your anti-virus software (Norton, McAfee, Kaspersky, Avast, Defender etc), says you cannot download the software. Depending on which anti-virus software you are using there are different methods to override this message and enable download. For some you can add Electacourse (or our download service provider – Amazon Web Services) to your safe sites, for others you might be able to override the anti-virus block at the moment of download. Please refer to your the ‘Help’ files which come with your anti-virus software. If your anti-virus doesn’t allow temporary overrides, then turn off the anti-virus completely and then download the Electacourse software. Remember to turn your anti-virus back on when the download is complete. Please be assured that all our software is virus free. Electacourse programmes do not contain any malware, adware or trojans. All you get is what is promised – a realistic exam simulator. My software is asking for an Activation Key, where can I get one? IET and other bodies regularly make significant changes to Regulations. In line with these changes, Electacourse invest heavily to update our products to keep them relevant to the current regulations for new customers. Because of this, purchased versions of the products should be studied soon after purchase. Depending on the rate and timing of regulatory change products can quickly become out of date. If regulations change within 6 months of purchase we provide affected replacement products free of charge. For purchases older than this, which includes any simulator requiring activation, we regret that because of its age it is no longer supported. We offer generous discounts to customers wishing to update previously purchased products. Please contact us with your request. If your software requiring a password is a PDF document, please check your ‘IMPORTANT PURCHASE INFORMATION’ email to retrieve your password. Contact us if you have mislaid this email.